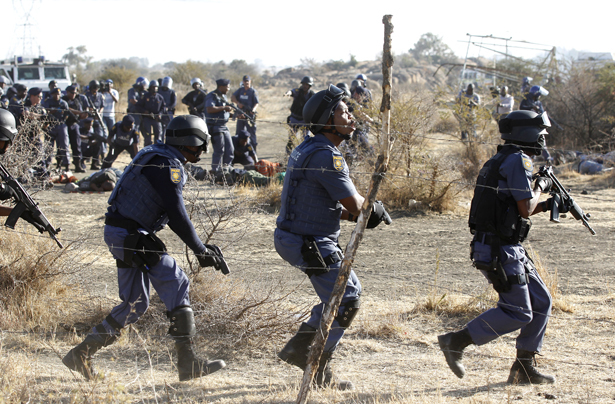 Policemen react after firing shots at protesting miners outside a South African mine in Rustenburg, 100 km (62 miles) northwest of Johannesburg, August 16, 2012. South African police opened fire against thousands of striking miners armed with machetes and sticks at Lonmin’s Marikana platinum mine, leaving several bloodied corpses lying on the ground. Reuters/Siphiwe Sibeko. The Marikana strike in South Africa is finally over, but the legacy of the massacre that took place there two months ago may prove to be as enduring as that of the Sharpeville massacre more than four decades earlier. On March 21, 1960, the South African police fired into a crowd of demonstrators protesting the apartheid pass laws at Sharpeville, killing sixty-nine. On August 16, 2012, the South African police fired at a crowd of striking wildcat miners at Marikana, killing thirty-four. Not surprisingly, many in South Africa have labeled Marikana the Sharpeville of our times, all the more devastating because the fingers pulling those triggers were controlled by a government voted into power to realize the aspirations of the majority rather than to shoot them down. In many respects, the Sharpeville reference is inappropriate. The protesters back then were fighting for basic rights to citizenship against a state that viewed them as subhuman; at Marikana, the protesters were fighting for a better wage against an employer with significant black ownership. In both instances the demonstrators were assembled illegally, but in the Sharpeville era the laws were unjust, while at Marikana they were merely being applied ineptly, albeit with equally tragic consequences. Yet on a symbolic level the analogy is apt. Both massacres represent thresholds. After Sharpeville, the state clamped down as never before, banning the liberation movements and forcing them into exile and underground; the African National Congress responded by turning to armed struggle. The consequences of Marikana might be less dramatic, but the massacre will nonetheless come to draw a similar line between one era and another, with the suggestion of innocence lost at the crossing. There will be pre-Marikana and post-Marikana, just as there was pre- and post-Sharpeville. President Jacob Zuma’s ANC has branded the current era the Second Transition: if the first, Mandela-led transition was about the transfer of political rights, this second, Zuma-led one, we are told, is going to bring socioeconomic uplift to millions who still live in poverty in a country with one of the world’s highest inequality rates. The major scandal in South Africa before Marikana was the revelation that an ANC “sweetheart” publisher had failed to deliver thousands of textbooks to South Africa’s poorest students for more than six months; the books have still not arrived. In this context, the Second Transition means something else: Marikana marks that tipping point when the liberation movement moved inexorably closer to becoming just another alienated party in power and the people lost faith in its transformative possibilities. This does not mean that the ANC is going to lose the next elections, scheduled for 2014. There is not yet a viable alternative. The one serious contender, the left nexus around the ANC-aligned Congress of South African Trade Unions (Cosatu), has proven itself too implicated in state power to perform the job of the opposition; this is one of the root causes of the Marikana tragedy. And so into the vacuum step wildcat strikers, flash-fire protesters, unwitting anarchists, men who believe traditional medicine will protect them from bullets, men who need a living wage and dignified living quarters, each of whose meager paychecks supports an estimated twenty-six people in a country with an intolerable unemployment rate—people who will become increasingly susceptible to the rantings of dangerous demagogues. The Marikana strikers, who belong to the parvenu Association of Mineworkers and Construction Union, were on strike for over five weeks. Workers have downed drills at eight other mines, all over pay increases. To contain the unrest, the government announced actions that stopped just short of a state of emergency, and began disarming strikers of their spears and knobkerries. The powerful National Union of Mineworkers (NUM), which belongs to Cosatu and played one of the decisive roles in the anti-apartheid struggle, was viewed by many of these new strikers as the enemy, in league with the bosses and the state; nothing symbolized this more than the position of Cyril Ramaphosa, one of South Africa’s richest men and an owner of the Marikana mine, who formed NUM in the 1980s. The South African economy has taken a blow from Marikana, and even with that strike over, there are augurs of further labor unrest. At the recent Cosatu congress, President Zuma warned that the strikes could spark a recession. But the country will not be engulfed in flames. The state asserted control, albeit belatedly, and at a price, for at Marikana it proved its alienation from the people: government ministers were scarce at the site of the massacre, and the decision to charge the striking miners with the murder of their comrades—rather than the police who shot them—under the apartheid-era “common purpose” doctrine was insane (a charge swiftly withdrawn after the outrage that followed). Thus drains away the dream of liberation. If a viable opposition does not arise to provide a new home for South Africa’s disaffected poor, the ANC will remain in power (much as the PRI did in Mexico) for decades. Power struggles will become bureaucratized, or refracted into leadership battles within the party; this is happening right now, in the run-up to the ANC’s all-important five-year conference in December. The expelled youth leader Julius Malema is whipping miners into a froth against their bosses and the government, but he has no interest in starting a new party. Rather, he is running an insurgent movement within the party, in veiled concert with some of its mandarins, to depose Zuma in December, just as he led the movement on behalf of Zuma to depose Thabo Mbeki five years ago. If Malema succeeds, the beneficiary this time will be the deputy president, Kgalema Motlanthe, a man far more substantial than Jacob Zuma but probably far more ineffectual too, judging from his past record. And whatever his potential, he will be hobbled, perhaps fatally, by having Malema and his ilk as outlier kingmakers. The situation can only deteriorate, and will improve only when a credible, sensible new generation of post-struggle leaders takes the reins, either within or outside the ruling party. There is, alas, no one in sight. And so the country remains on edge—if not, it must be said, on a precipice. South Africa will not become Zimbabwe. It has a Constitution that is its hallowed foundation stone, which all parties are compelled to pay lip service to, even if they would rather not. It also has an economy that can weather a flash-fire crisis, a vast private sector and many sound organs of civil society, from a free press to an independent judiciary (for now, at least), to keep state power in check. Still, given that we must anticipate increased—and perhaps increasingly desperate—protest in the months to come, the question must be asked: Will there be more Marikanas? Jacob Zuma’s government is not a steady enough hand on the trigger—or on the tiller—to inspire much confidence.